Frank Barnes's "Cartridges of the World" (8th Ed., 1997, DBI Books), p.320, lists the .300 Sherwood cartridge as being introduced in 1901 by the Westley Richards company as an answer to the .310 Greener cartridge in Great Britain. The first rifles chambered for it were, as expected, made by Westley Richards and included a Martini action single-shot rifle and the "Sherwood" target rifle. Other manufacturers did, however, produce rifles in the caliber and examples by BSA (Birmingham Small Arms), Vickers, and Francotte are known by the author of these pages. Very high end double rifles by Holland & Holland and Westley Richards were also produced in the caliber and in 2002 a "Westley Richards Boxlock Ejector Double Rifle" is offered as a used rifle by Westley Richards for a price of $7,900. Needless to say, most collectors, who have interest in the caliber, are looking for a more modestly priced example. The cartridge itself is of a straight walled design with a rimmed case of length 1.54 inches, .320 diameter, and an overall length of 2.02 inches. The bullet diameter is .300 (not the much more common .308 diameter of the .30 caliber family of cartridges) and is generally provided with a 140 grain lead or "LT capped bullet". Barnes lists a muzzle velocity of 1400 ft/sec and a muzzle energy of 610 foot-lbs for a 140 grain JHP bullet as the factory load. A later chart in Barnes (p. 343) lists a loading of 8.5 grains of "Cordite" for a 140 grain lead bullet producing the same muzzle velocity as previously noted. 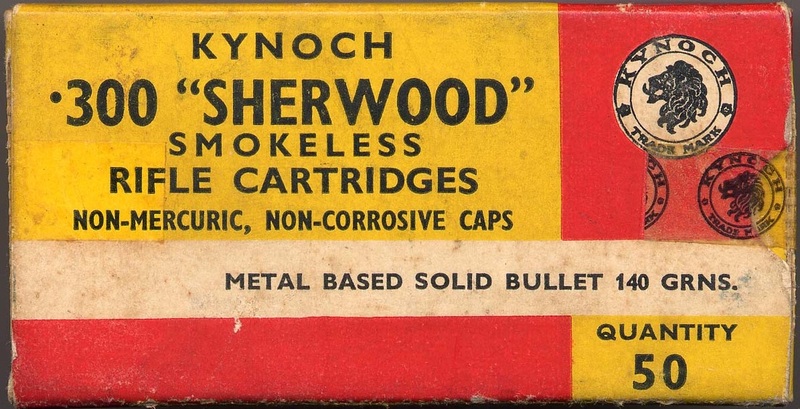 Two varieties of .300 Sherwood cartridges have been obtained by the author. Below is a scan of the two with the Kynoch example on top and an unknown manufacturer (no headstamp) below it. The Kynoch headstamp is also shown. The overall length of the Kynoch is 2.035 inches with a case length of 1.54 inches. The case diameter just above the rim is .318 very slightly tapering to .315, basically as straight wall case. The rim thickness is .045 inches. All of the dimensions are very close to the Barnes listing. A picture of the Kynoch box is also shown.